Please find attached hereto copies of the Final Pools, Fixture, Rules and Roster for the Tourny (as well as, our Poster too J). We extend our apologies for the delay in getting same to you as we have had numerous Teams pull out of the tournament at the last minute and a few individual requests which we incorporated into the Fixture. 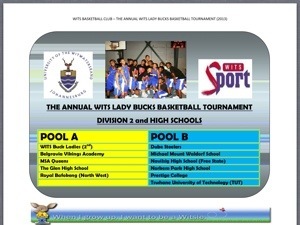 We reiterate that the WITS Basketball Club has made every effort to ensure that the Fixture is correct and fair, considering the number of participants as well as, the time frame within which to work. However, should there be any error(s) – kindly revert and we will attend to the necessary amendments ASAP, so that there are no issues during the Tourny. Otherwise, the Fixture as it stands remains final!! We also kindly request that you forward this email to your Team, as well as any interested parties for their information. All team managers are to ensure that their Team’s Roster is handed over to one of the Tourny officials prior to the start of their games. To all spectators who intend on coming, please note that there will be a daily entrance fee for ALL MEN of R5.00. Women and children will be exempt from such fee on Friday, 09 August 2013 ONLY and thereafter, be required to pay R10.00 and R5.00 respectively from Saturday to Sunday. Food and beverages will be on sale for the duration for duration of the Tourny. Tshwane University of Technology (Pretoria, Gauteng). We take this opportunity to wish all Teams the very best. Should you require anything further, kindly contact me on the email address listed above for the duration of the Tourny. 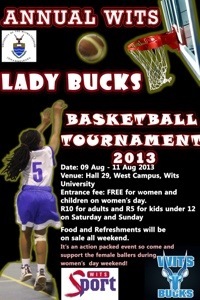 This is our second Women’s Tourny so let’s make it better than last year! !